The Baths Hall is a 10 minute walk away from Scunthorpe train station. Scunthorpe is on the main line and has direct links to Grimsby, Doncaster, Sheffield and Manchester on an hourly basis. The Baths Hall is only a 5 minute drive from the M181/M180 and just 20 minutes from the M18. Leave the M180 at J3 signposted M181 for Scunthorpe. Travel two miles along the M181 until you reach a roundabout at the junction of the A1077 and A18. Take your third exit at this junction and remain in the right hand lane to go straight on. You will pass retail parks on the left and right before reaching another roundabout. Take the second exit (straight on) and head up the hill. Travel straight along Doncaster Road for approximately one mile until you reach the junction with Henderson Avenue. The Baths Hall is on the right hand side. Taxis can pick up right outside the venue before and after events. There are also taxi ranks on Henry Street which is a 2 minute walk from the venue. Scunthorpe Bus Station is a 10 minute walk from The Baths Hall. However, there is a bus stop right outside the venue. If travelling by car, please allow plenty of time for your journey. For satellite navigation, the venue's postcode is DN15 7RG. 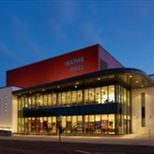 There are over 700 car parking spaces in council-owned car parks within a 10 minute walk of the theatre. A list of all car parks can be found on North Lincolnshire Council's website. North Lincolnshire Council car parks are currently free to park for the first two hours and free again after 6pm. The Parishes is free to park in after 2pm. There is no on-site car parking at The Baths Hall. Please note - we advise guests DO NOT use the car park at Sainsburys and do so at their own risk. We have a small number of designated disabled parking bays available on the public highway next to the venue. The Baths Hall is not responsible for vehicles left in these spaces. The badge holder must be present in the vehicle. Spaces cannot be reserved and are available on a first come, first served basis.